A personal favorite, Media Converter is just an empty window into which you drag the files you want to convert. There’s a list of conversion profiles to choose from, naming most of the devices you’re likely to be converting for, so there’s no need for any technical knowledge. I especially like that the deeper settings are available in the app and even more device profiles can be easily downloaded to it from the developer’s website. Media Converter is undemanding and beaitifully easy to use. 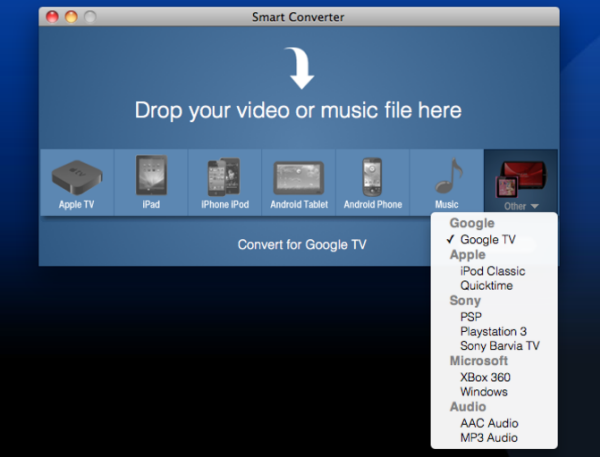 Really popular on the Mac App Store, Smart Converter is possibly even easier to use than Media Converter. It’s single paned drag and drop interface has a row of popular device buttons, and you just have to click on the one you want to get a video converted for it. It really is conversion for absolute beginners! The drawback when compared to Media Converter is that there isn’t anything more complex in the background, so if you do want to customize the settings.. we you can’t so try not to! These are the best free simple video converters I’ve used on Macs: have you found anything better?